This week on UM News, a new documentary is bringing Missoula and refugees together. 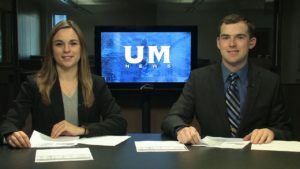 Plus, staying up all night to help St. Jude Children’s Hospital, UM Musicians teaching a new way to play piano, a Native American Student group is raising money for it’s 50th annual Pow-wow and how pets are relieving stress across the community. Matt Skillman and Meghan Bourassa anchor while Tiffany Folkes directs.